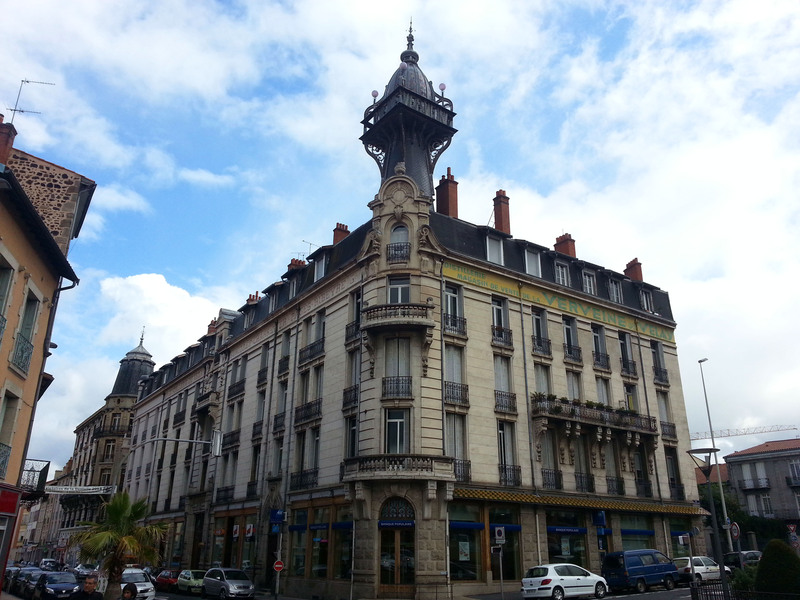 Lyon became a base for several excursions into the French countryside. It was a weird moment when I started planning to come here as its pictures through a 1920’s lens made it seem unreachable. Yet here I was. I’d been greedily absorbing beautiful photos of the area taken by Neville Whall in the 1920’s and was worried it wouldn’t hold up in reality. I was desperate to explore it myself and if anything I was even more awed by the sight than stunning 3″ glass photos promised. It’s a beautiful and bizarre place – volcanic mountains shoot up from the ground that was hilly to begin with, making the whole place feel like it’s a churning ocean frozen in place. There is nowhere flat that isn’t man-made, and most structures just try to make do with whatever angle they find themselves on, like so many crustaceans crowded around a high-tide mark. Add gorgeous red roofs and Grand Designs competitors and you have one of my favourite places in France. 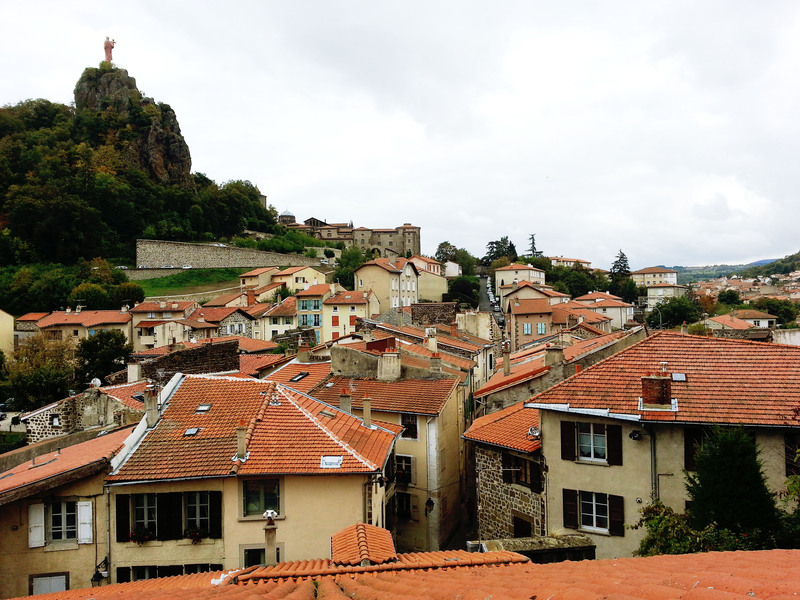 Le Puy has three such mountains, for want of a better word – spikes, monoliths, needles might be more accurate. In fact it is the word, as “aiguilhe” means needle! And since the first construction atop one of them over a thousand years ago, all three now have a religious attractions that tower over the landscape for miles around. The first, and best (of course) is Saint Michel d’Aiguilhe, a tiny chapel on the thinnest needle. It was thought to be an ancient dolmen (pagan tomb) and then used to worship Mercury by the Romans and finally turned into a chapel in 962 A.D.
That’s the chapel on the rock there. Hard to make out I know. The second is the cathedral that was built when the the pilgrimage of The Way of St. James which was a pretty major pilgrimage to Spain. 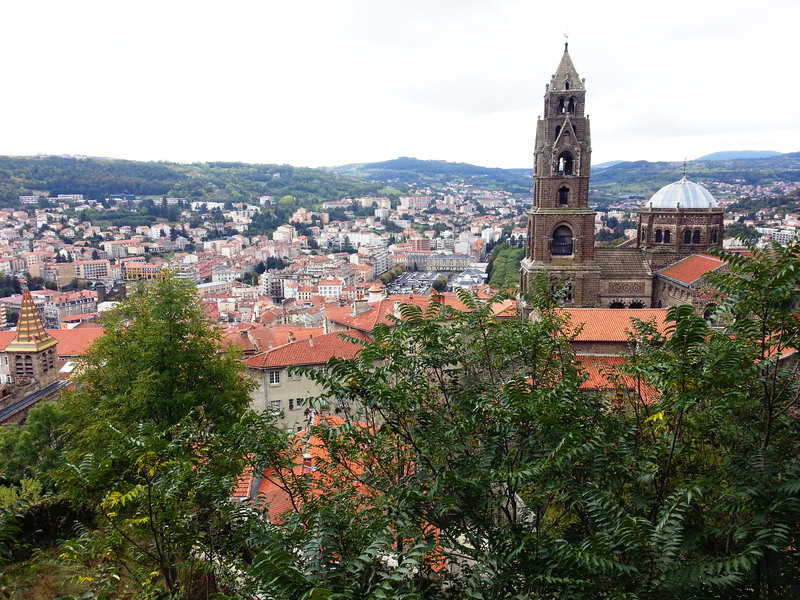 It’s the supposed burial site of that saint and begins its official journey from Le Puy from medieval times. The last, built in 1860, is a giant statue of the Virgin Mary, and uses the same technology for the Statue of Liberty which makes it pretty ahead of its time. It’s made from 213 Russian cannon taken during the Crimean War. We like recycling! Mary is a bit of a shameless tourism ploy, but it works, so who am I to complain? I climbed the never-ending staircase to the ticket office, then climbed a bit more (she’s the tallest of the three) and then discovered I could climb up through her and look out of the crown of her head. Praise be. Angels sang, miracles occurred, banal photos were taken. An impressive design for construction. There are a few portholes to get a good view from Mary’s legs. 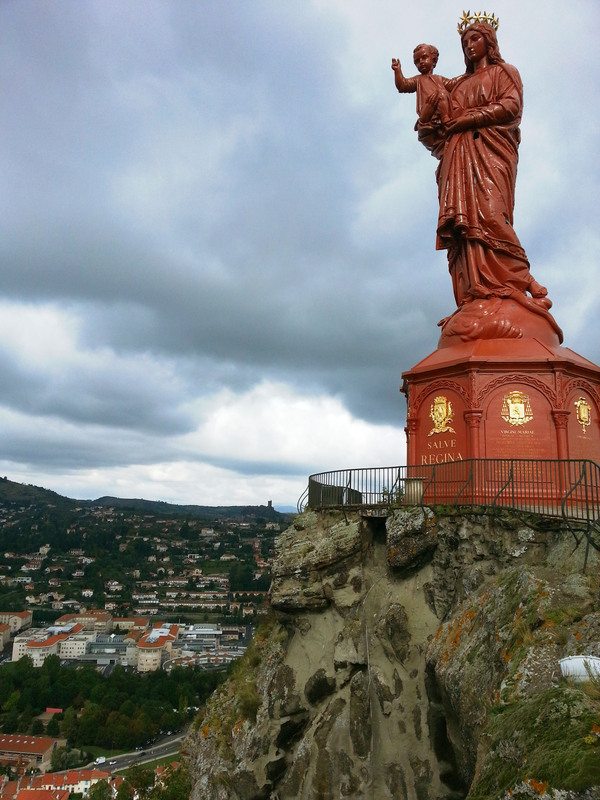 It was only the next day, when I walked to the next town over (Vals-près-le-Puy – literally “the valley beside the volcano/hill) to check out their huge religious tourism statue that I realised the whole area was pretty much a scene of cosmic custody battle; both parents hold a baby Jesus and stare at each other with hardy ambivalence. It’s pretty creepy. 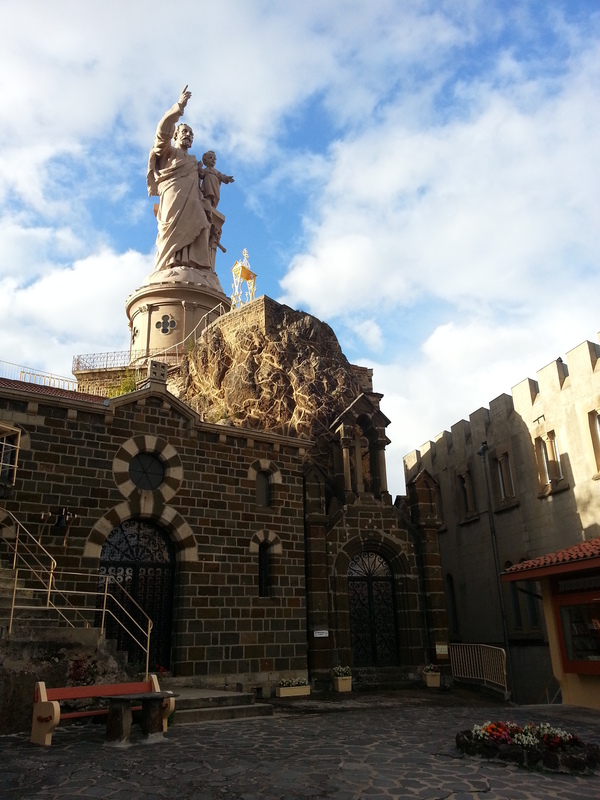 But Joseph stands on top of a gorgeous castle-come-cathedral so it’s worth the visit. I loved walking around a town where every road curves and doubles back on itself and you regularly feel like you’re trapped in a town designed by Escher, it’s that disorientating! 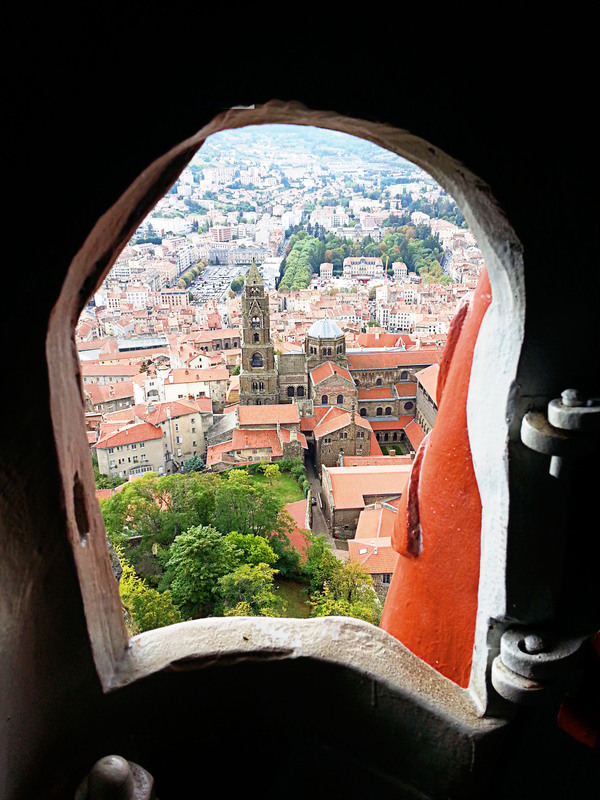 The cathedral at Le Puy is built on the largest and therefore most useful mountain for inhabiting, so it’s a lovely maze of buildings at different levels with hidden staircases and wonderful architecture to compensate for the insane incline. The cathedral itself is not all that large by France’s standards, but its vantage point and use of startling and steep hillsides on every edge make it pretty breathtaking. And whoever designed the entrance vault really knew what they were doing. 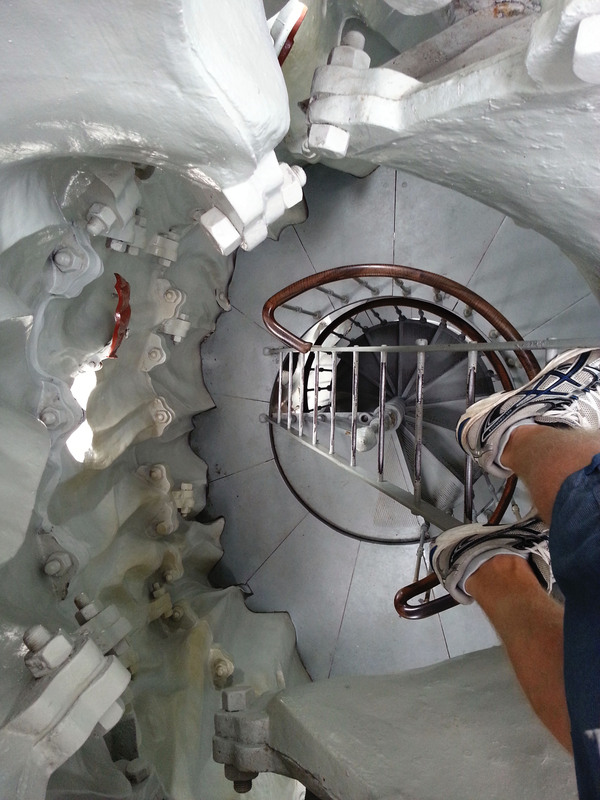 It’s huge to start with, but add a hundred foot incline leading up to it and you feel really small climbing the stairway to it. And finally, the chapel of St. Michael, that has stood and watched with quiet horror as a whole bunch of weird stuff was built around it over the last millennia. I have tried to avoid waxing lyrical about this place as it’s pretty clichéd as ancient religious sites go. It’s on a smaller needle than the other two, but it’s still an epic climb. You notice that even the houses at its base are of a more noble and serene atmosphere than the rest of the town. The old gents who chatted over their garden fences nodded to me sagely, as if I was truly on a gruelling pilgrimage across France and Spain. I can’t imagine what having this as a view out of your window does to house prices. Standing outside the entrance to this tiny structure seemingly precariously perched on a pointy end of a wedge of stone I can’t help but think of more ancient minds holding such a scary wind-blown place as an access point to the gods, or afterlife or just the sky in general. The weather has been English all week and now it really reminds me of Albion when the freezing winds begins to spit water into my face. 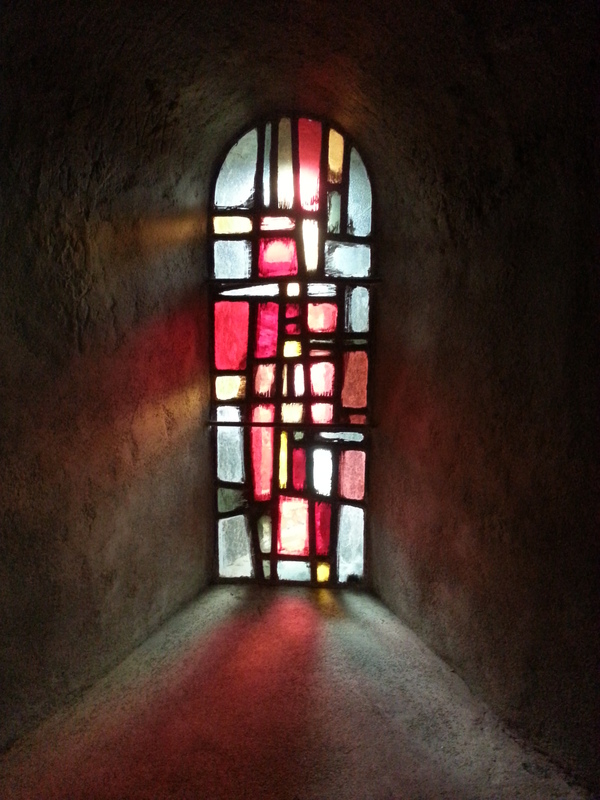 I stumble into the dark interior and discover the tiniest vaulted hall ever built; a row of columns in living rock arrayed in a semi-circle around a sunlit altar. The walls are rough and jagged, and there’s ancient paintings of biblical scenes on the walls. It’s so still and quiet I can do nothing but stand and listen for a long time, contemplating what this structure represents. I begin to feel a deep rhythm of time in the walls that doesn’t recognise a human’s life as anything other than an annoying high-pitched background noise. I can sense the silent confidence that even when my pitiful efforts in this life have long faded, this room will still be. This needle will stand and continue unchanged. I can feel a patience and sense of waiting in the walls that still ring with a thousand years of prayer and spiritual beseeching. I feel a melancholy and joy at life’s precariousness and many more subtle conflicts of feeling that might always be there, buried under the noise of life, the doubts and hopes that are more endocept than thought, more primal than language can handle. I simply have to set a scene of my novel here. I spend maybe an hour writing in the complete silence, just absorbing the energy and revelling in the clarity of thought that this space creates. Then a tour guide comes in with a German couple and things get a lot less introspective for a while. I mean, these people haven’t even turned off the ‘click’ sound of their camera phones. I wait it out and spend another few hours in the timeless clarity I can only yearn for everywhere else. This is the worst and best stained-glass I’ve ever seen. Each piece is a recycled shard of glass filed and fitted by loving hands. 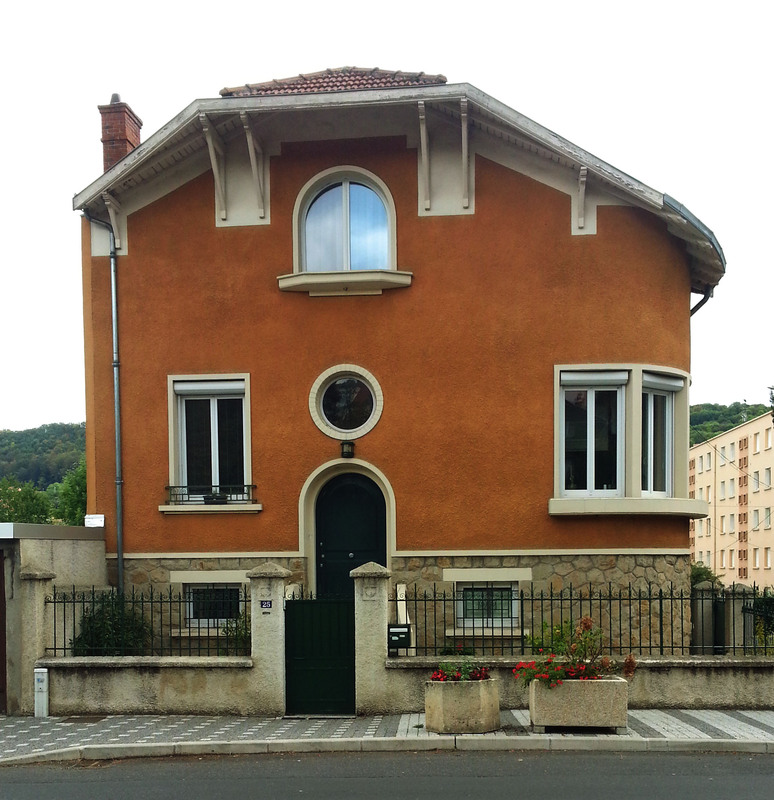 Every window is a different shape and nothing is level or symmetrical, yet it is perfection. I caught the organic farmers’ market on my last day in Le Puy and even joined my hosts attending a traditional French ball, which was a boon as I had actually been practising my ballroom dances. I only made an average fool of myself trying to learn French waltz and the local folk-dance which was a bit like hop-scotch Capoeira with a lot of room for free-style in the middle – great fun! But enough introspection, Lyon was waiting to see me off on my journey home. This entry was posted in Blog, France and tagged France, photography, spiritual. Bookmark the permalink.